*Shadow Heaters only. Manufacturer warranty may vary. 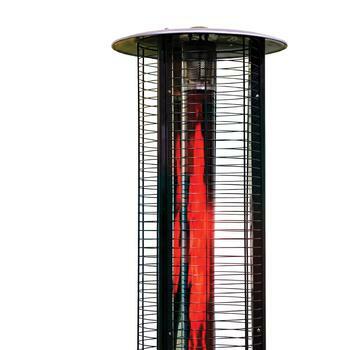 From enchanting flame heaters to sleek ‘lamp-style’ models, get cosy outdoors with our extensive selection of gas garden heaters. Whether you’re investing in a gas garden heater for your evening barbecues, or looking for a simple outdoor heating solution for your open-air dining area or commercial space, you’ll find something to suit you here. 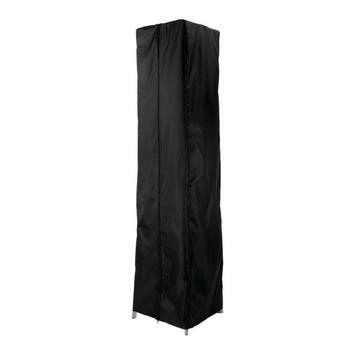 Goliath is widely acknowledged as one of the best commercial gas heaters available. Used by well known brands like Carluccio's and Bill's restaurants. There’s no doubt about it, our gas patio heaters are a stylish bunch. Without the garish orange glare that some less sophisticated infrared heaters produce, these models provide a romantic and atmospheric alternative. A popular choice for high-end restaurants, bars and urban food markets – they’re stylish enough for even the most discerning patrons to bask beneath, and they provide a contemporary focal point for your space. Nothing is more important than enjoying your heater in a safe, controlled way – so the safety of our technology is our top priority. 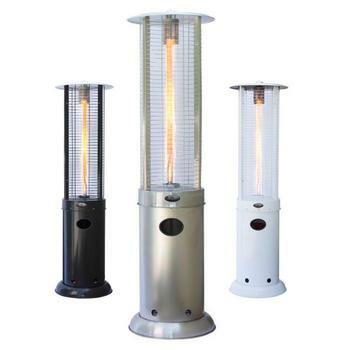 All of our gas patio heaters feature a protective mesh or flame guard as standard. For an enhanced level of safety, look for models with integrated anti-tilt mechanisms such as our Athena Plus+ Stainless Steel Gas Heater, providing perfect peace of mind while you stay cosy. All of our gas-powered models are completely cable-free. There’s no need to locate these heaters near an electric power source. 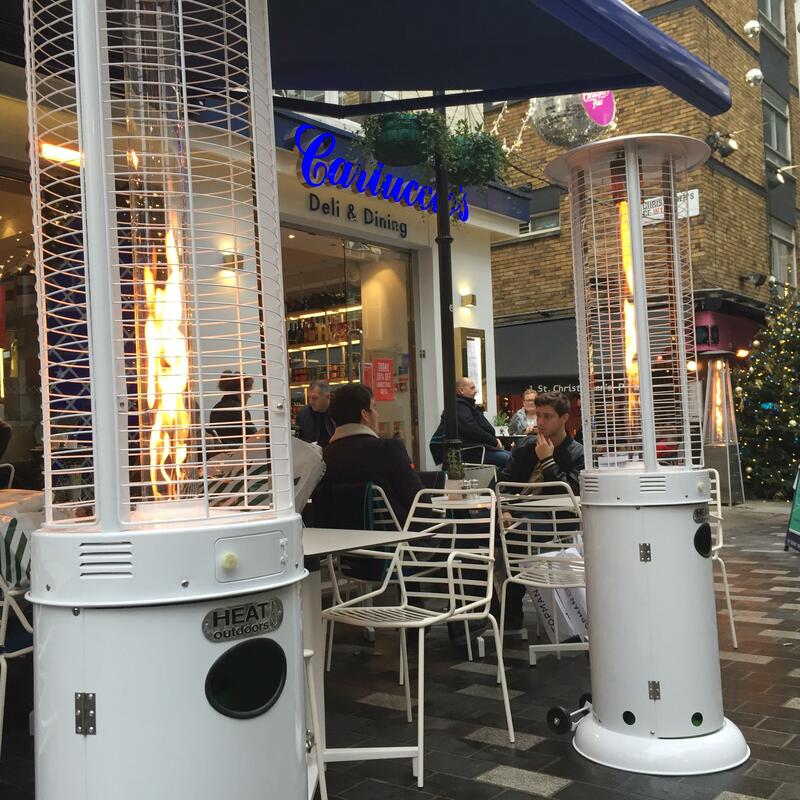 With a self-contained source of fuel, gas garden heaters bring warmth to the furthest reaches of your pub garden, courtyard or outdoor event space. So, say farewell to trailing extension leads and overloaded power sockets, and bid a warm welcome to a quick, easy-to-operate outdoor heating supply. Not only will these heaters help you maintain a stylish outdoor aesthetic, the absence of wires and cables means one less trip hazard for busy outdoor spaces such as football grounds and concert venues. Which are the most popular gas patio heaters? 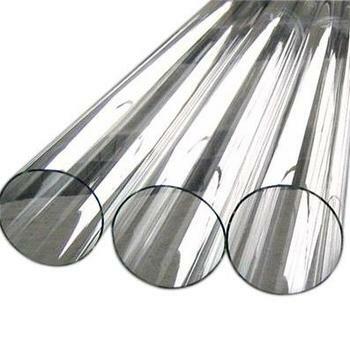 Due to their atmospheric glow and competitive price, gas heaters enjoy near-universal popularity. 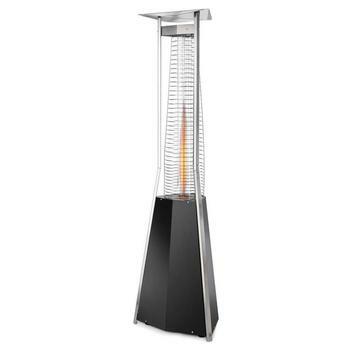 Undeniably stylish, the dancing flame of a pyramid heater is an attractive addition to any garden. Whether you’re hosting an intimate evening get-together or a full-scale garden party extravaganza, flame pyramids will provide a great deal of pleasure for everyone. With a generous heat output of 13.5kW, flame pyramids like the Athena Plus+ can provide comfort for large gatherings and outdoor events – you won’t need more than a few to keep a large patio or terrace nice and toasty. 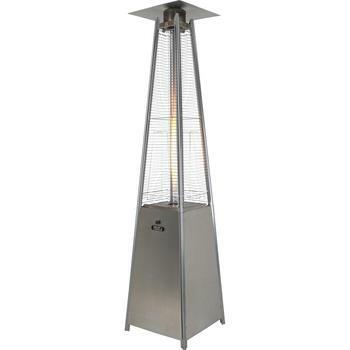 Robust in any weather, the Athena comes in a rust-resistant stainless steel finish, and its flame is protected from sudden gusts of wind by a tubular glass enclosure. As with all gas heaters, traditional lamp-style models are incredibly easy to assemble, operate and refuel. The London Gas Lamp is assembled in seven easy steps, and its simple push-button starting mechanism is intuitive to use. 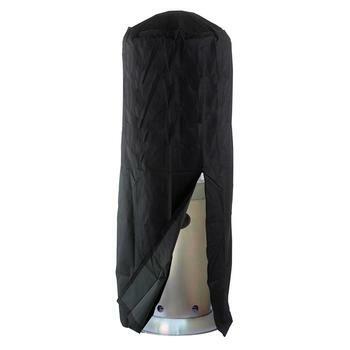 This makes it one of the most popular types of outdoor heater for commercial enterprises like restaurants and pubs, where front-of-house staff are rushed off their feet. 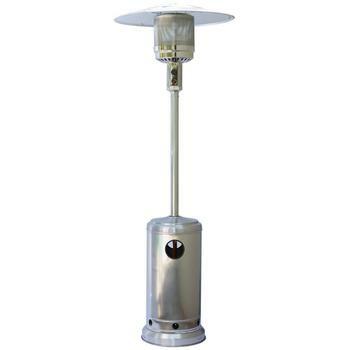 With a powerful heat output and wide heating radius, lamp-style heaters can warm a large outdoor area. The money you spend on gas literally goes a long way. Featuring a canopy top to protect the flames from sudden rain showers and the inevitable ‘presents’ dropped by birds, lamp heaters are an obvious choice for hassle-free outdoor heating. For the ultimate ‘campfire’ feeling (without that tiresome hunt for firelighters and kindling), gas fire pits are becoming a popular addition to outdoor terraces and rooftop venues. Running on propane gas and nothing else, a fire pit won’t leave your clothes and hair smelling of smoke, and it’ll burn steadily. This means you and your guests will enjoy a consistent level of warmth without any lingering odours. Some models have decorative surrounds or tables surrounding the fire pit, often built using eye-catching materials such as concrete, terracotta or coloured glass. This makes them an attractive focal point at barbecues and outdoor get-togethers. Although fire pits are popular, the flames are usually open to the elements. This makes them slightly less safe than traditional gas patio heaters, which are fitted with safety guards and protective mesh to prevent accidental burns. Because the flames are exposed, fire pits are also unsuitable for use in high winds or in rainy weather, whereas gas patio heaters are specifically designed to withstand the elements. 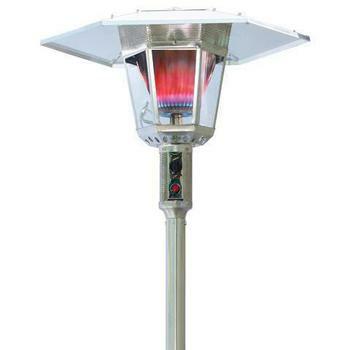 Why choose gas garden heaters? Gas heaters have an admirable ability to throw heat over a generous area, producing a perfect circle of sensational heat. Your guests never need to huddle directly underneath flames to feel the benefit. All of our gas models come with a small number of parts, and a clear set of assembly instructions (including written safety guidance). This makes them incredibly quick and easy to put together. You can set up a gas heater in a matter of minutes. 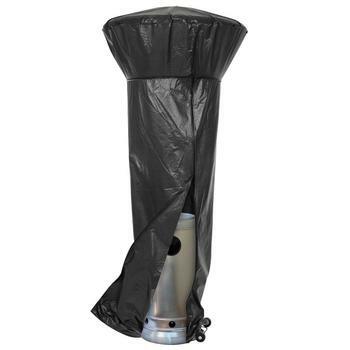 Once you’ve assembled your patio heater, all you need is a gas canister and away you go! Gas models are often more portable than electric heaters. The fact they’re powered by an internally fitted gas canister allows you to place your heater almost anywhere you please (so long as it’s safe), rather than having to fix it to a wall or install it near a mains power socket. Some gas patio heaters – such as the Sherpa – have wheels attached to the bottom, allowing you to pull them effortlessly from A to B. You should never attempt to move a gas heater while it is in use. Whereas some electric heaters can be unsuitable for open-air use during rain, snow or other wet weather, gas models have no electrical component. Gas heaters can be left outdoors indefinitely. To help protect your gas garden heater when not in use, be sure to safeguard it with a weather and guano-resistant cover. Although electric patio heaters are on the whole more economical than gas heaters, gas heaters are ordinarily cheaper to buy than electric models. What’s more, gas can be more than 50% cheaper per kWh than electricity. If you plan to use your patio heater only infrequently, a gas-powered outdoor heater can sometimes be a more economical solution than a mains-powered heater. Gas not only provides a great deal of warmth and comfort – it’s also a more visually striking heat source than infrared or electric heating. Whether you love staying outside in the evening with family or you’re planning a big outdoor event, creating the right mood is always important. 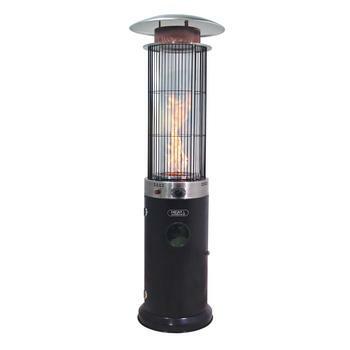 The flickering flames of a gas patio heater are arguably a more atmospheric sight to behold than artificial glare. Enter your email address and we'll let you know when we have special offers and promotions on. Shop with confidence at heatoutdoors.co.uk where we accept the following methods of payment.